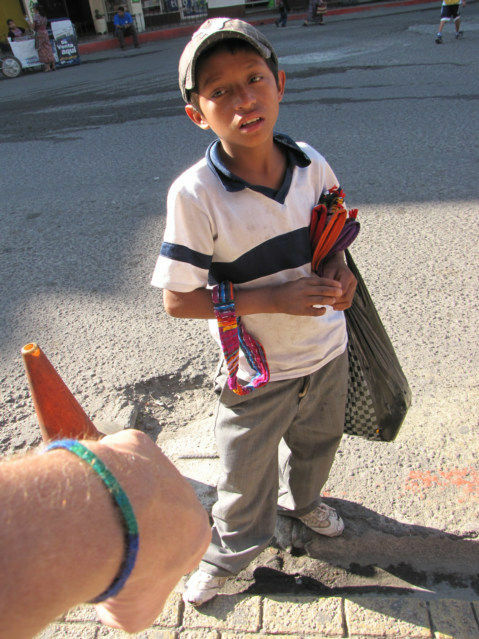 It is the custom of travelers in Guatemala to wear multicolored bracelets made from yarn. I decided yesterday to buy my first bracelet for this trip into Guatemala. This little boy was lying on the ground in pain after a Guatemala Tuk Tuk Taxi hit the back of his leg. I decided it was a good time to buy my first yarn bracelet. The small bracelet like the one on my wrist above cost about one Quetzal, which is about 12 cents U.S. not much for 30 minutes of weaving. Generally, tourist and travelers call these items, "Typicals," more or less the typical type of colors, clothes, and items made by the Guatemalan locals. I am always debating about these items for years, they make great souvenirs, and however are horrible products to sell in a global market. For example, if they knitted nice sweaters of American or European styles, they would be able to export mass quantities to other countries as normal clothing. Sadly, the majority of typical products made by the indigenous people of Guatemala cannot be sold in Malls in the USA; they are only souvenirs of Guatemala, which is the end. This is a major business mistake of the world, making products that only are useful within their own country.